Since many years FAMOS robotic® is used for water jet cutting. Especially here offline programming with FAMOS robotic® pays off quickly. You would spend many days by teaching the complex parts and block the robot cell- not that kind with FAMOS robotic®. All cutting programs will be made comfortably, safely and quickly using your PC. 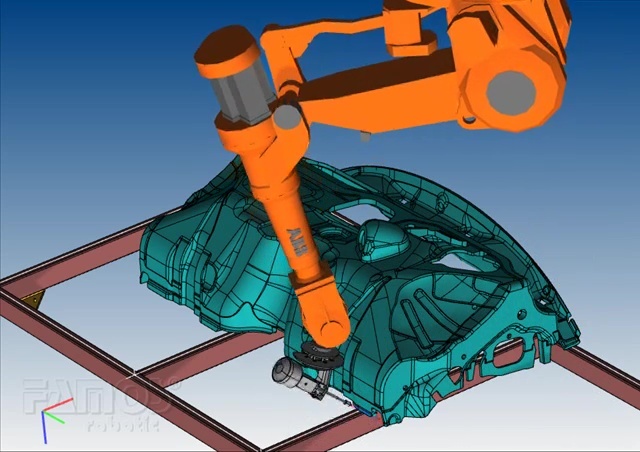 The robot cell is only used for calibrating the positions of the real work object. High availability of the cell for production. The programs will be made in the origin coordinate system of the 3D CAD model and are based on the 3D CAD models which were used for manufacturing of the waterjet fixture. Inspection records from a coordinate measuring machine can be transferred at a ration of 1: 1 to the cutting programs. Better and more safely labor conditions for the programmers. You can easily discuss the project with colleagues, customers or supplieres due to the visualization of the waterjet fixture. Automatic recognition of circular geometries for example which were generated as "MoveC" (circular) movement commands. 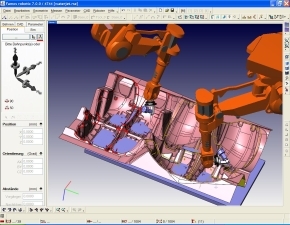 FAMOS robotic® supports "CutL"- commands for ABB robots. The distance of the water jet nozzle to the surface can be adjusted easily by parameters. The setting angle of the tooling along the cutting outline can still be adjusted arbitrarily. In/ out motion existing (water is inert and FAMOS robotic® forces an overlap of the cutting outlines). The visualization of the water beam eases the monitoring of the project. said Mr. Lendeckel process specialist and programmer at HP Pelzer in Witten, Germany. The programs which are made and tested in Witten will be forwarded to other European production plants and will be commissioned then together with the waterjet fixture. 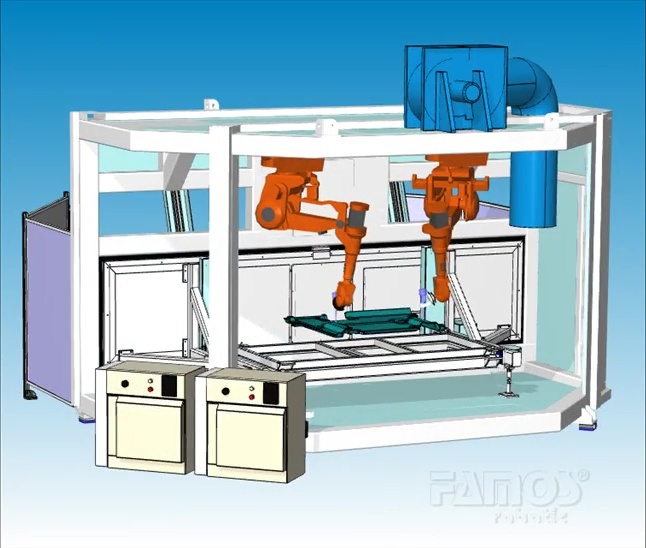 The adjustment and optimization of the programs happens quickly and precisely with FAMOS robotic®. For that reason HP Pelzer have already invested in the almost tenth license! An investment which pays off quickly!